What are the crucial features of a heat storage tank? … fits through doors due to on-site assembly. … excellent vertical stratification only possible with composites (stratified thermal storage). … safely operates over long periods. 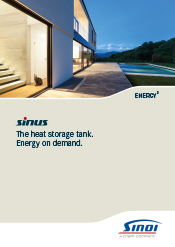 ... heat storage medium water is non-toxic, has high specific heat capacity and is availble almost free of charge.